So, what makes this range stand out from the crowd? Firstly, if you don’t yet know the gender or simply want to shy away for pink or blue, the collection keeps things fresh with a violet and light green colour palette – perfect for those with an aversion to pink. In terms of design, the range defies convention, too. 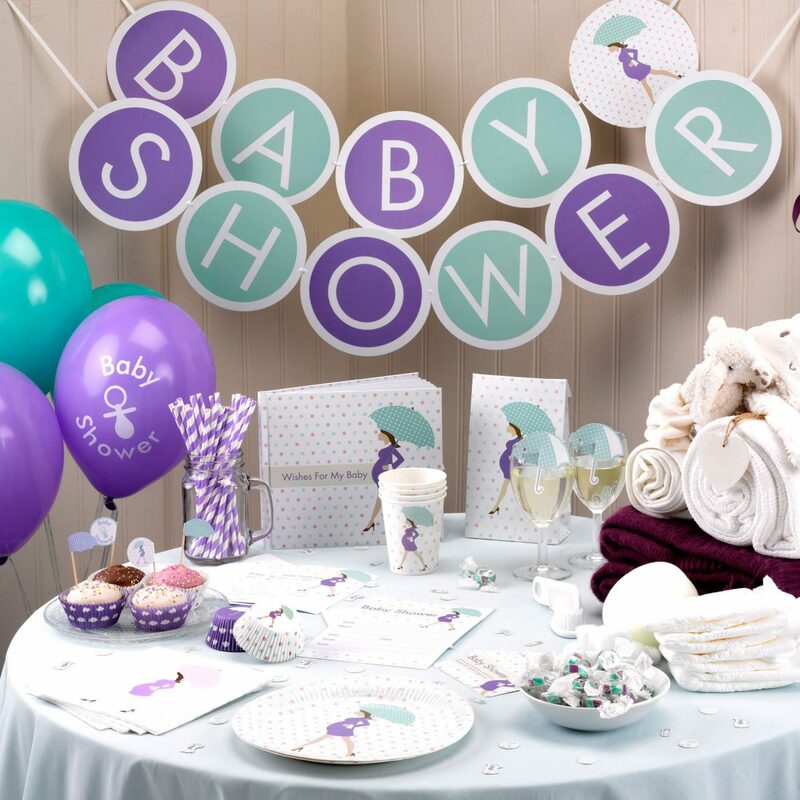 While a baby shower is the ideal time to indulge in cuteness, if that look is really not for you, this range might be more in keeping with your preferred aesthetic if you like simple, clean design. 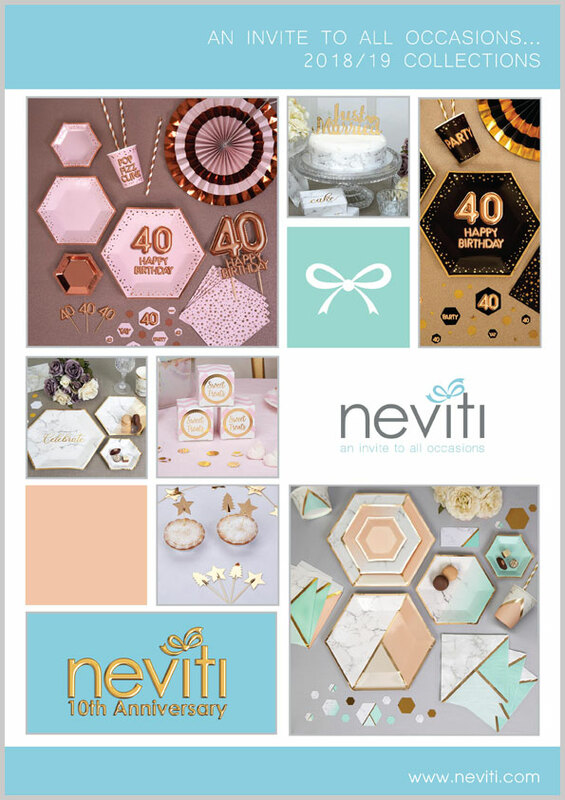 With everything covered in the range – tableware, cake accessories, baby shower games and decorative items – you can create a really cohesive look for your celebration without going to too much effort. 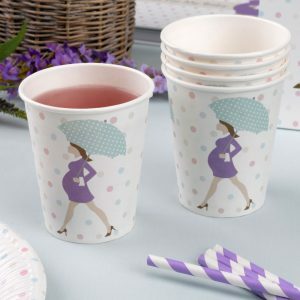 A quick batch of homemade or shop-bought cupcakes gets a stylish touch with the addition of purple and white cake cases and matching picks, while you can make the pre-requisite celebration fizz look extra enticing by sitting a pretty umbrella decoration on your glasses. Or how about making up a selection of fruit cocktails and serving them in vintage-style glasses, accompanied by one of our purple and white candy-stripe straws? Have a browse online for some exotic ideas to keep things fun for those not on the alcohol. Showered With Love motif, perfect for filling with your choice of items. We like the idea of mini nail polishes, retro-style rock sweets (you’ll find these in the collection) and a slice of cake. Pop in a thank you note so you won’t need to do this after the event. 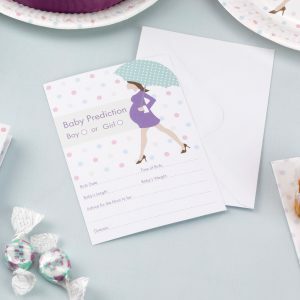 In between opening your own gifts and nibbling on sweet and savoury treats, another idea for some fun and baby shower games is our prediction card game – your guests can have a punt at predicting the birth date, weight and gender, among other things… a lovely way to get everyone chatting during your celebration. 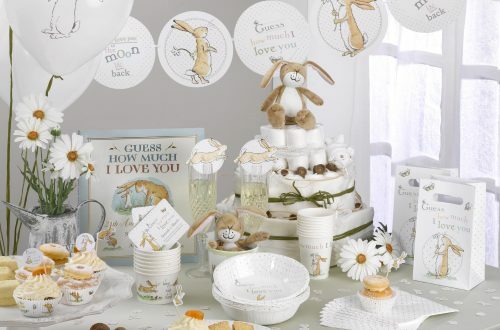 Collect the cards at the end and see who is the most accurate in their guesswork when your little one arrives – the cards make a lovely keepsake, along with our guest book, a beautiful book where friends and family can record their special messages for you. 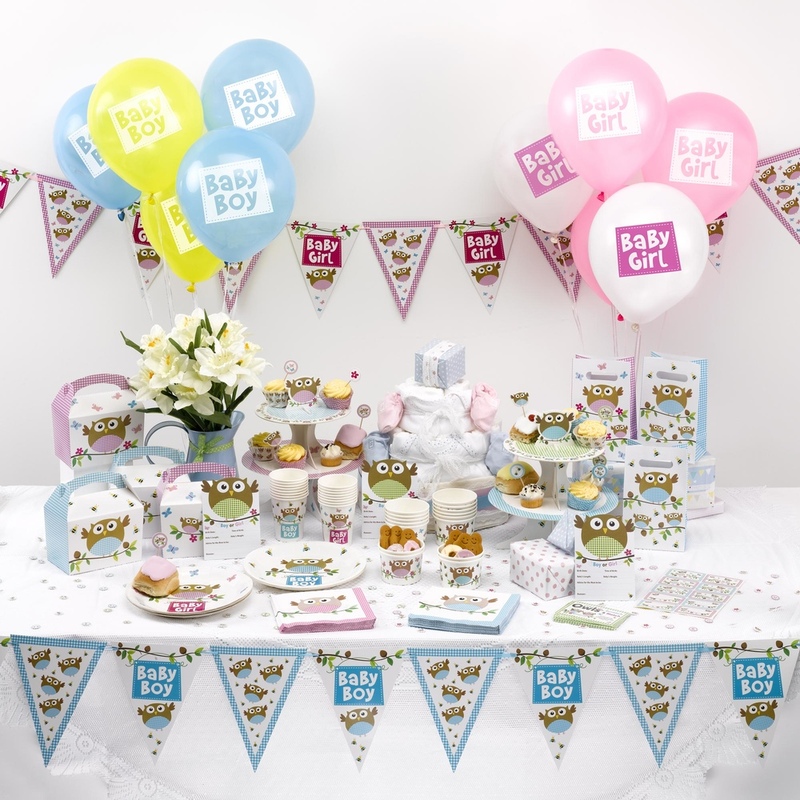 In terms of decoration, you don’t need to make life difficult for yourself – our bunting, balloons and table confetti offer a simple, fuss-free way to give your home a makeover. Simply add some fresh flowers into the mix to make your party room look extra pretty. Bring a personal touch to the occasion by making a photo collage of the mum and dad to be when they were little – your guests will love taking a peek at all those cute and embarrassing photos! 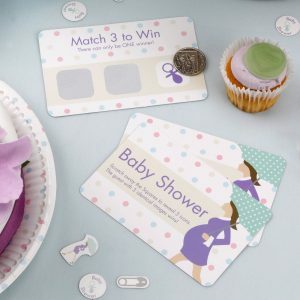 You can take a look at the full Showered With Love range and included baby shower games on our website: www.neviti.com.